Ladybug Diaper Cake Discounts Apply ! 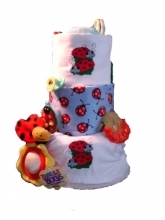 The Ladybug Diaper Cake makes a wonderful centerpiece for any springtime baby shower, or a great welcome home gift for the new bundle of joy. 1 - Hand crafted baby bib. 1 - Pair of booties shoes or baby socks. These Ladybug Diaper cakes are custom-made at the time you placed your order, so please allow an additional 5 days for our cake creators to complete your cake. Cakes may not be exactly as pictured due to available products and creative whims, but your special cake will be equally (or even better) than the ones pictured. *This item may ship separately from other items in your order. Free Shipping is by standard or ground service, and will take 2 - 7 days in addition to the creation of your cake.